I am trying to determine the condition of the rear hub bearings? Should the rear bushing be hard to turn? Mine are. shouldn't the bushing drop out when the wheel is removed? The bushings on my 990 fall out and roll away by themselves. 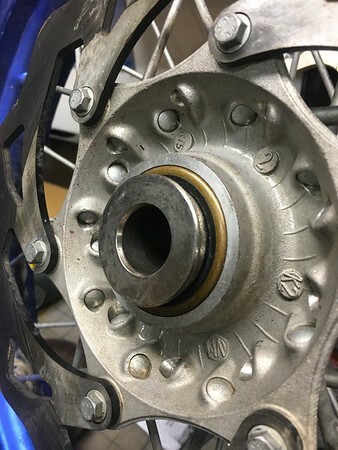 If you mean the wheel spacer,No it should not just fall out,it should seat inside the hub firmly, if you feel a lot of resitance or a lot up play up and down,then yes replace those bearings. I would recommend using top quality bearings and seals,like skf or oem,it really makes a difference,I know from painful experience. yes, bolt the wheel back in bike, place a hand each side of the tyre , try and shake it sideways, if there is any movement, that will indicate the bearings are done. You may also while the wheel is out, stick a finger in on the inner bearing race and turn it. If it is notchy , very loose ,or doesn't turn very freely , then it is shagged also I would say. I used to get about 200hr out of bearings. As mentioned, do the seals also. You can flick them out with a flat blade screw driver. I then stick a long drift into the middle of the wheel , shake it back and forth, this will lay the spacer to the side, allows me to then get a drift onto the bearing to knock it out. Make sure it comes out evenly. Before you knock it out, I would say there will be a cir clip that needs removing first. Place the new bearings into the freezer for half hour, it will make it slightly smaller and will tap in easier , make sure you don't hit the dust seal or inner race tapping it in. Can use a socket just slightly smaller than the bearing or end of a bit of pipe to get the new bearing in. Of course , this is properly not using the correct toolage or preferred methodology , but it works for me, ha ha.